On 9 March, IADC submitted comments to the U.S. Department of Interior regarding the Draft Proposed Outer Continental Shelf Oil and Gas Leasing Program for 2019-2024 (DPP). The DPP is the first step in the legislatively mandated process that will ultimately determine the available leasing areas for oil and gas development on the Outer Continental Shelf. “IADC has long argued for access to areas that hold potential for oil and gas development, and is supportive of a leasing plan that makes 25 of 26 U.S. offshore areas available for leasing. This unprecedented action clearly reflects a concerted commitment to develop offshore oil and gas resources in an expeditious and orderly manner, and is vital to meeting the challenges of a 28% increase in global energy demand by 2040 as forecasted by the EIA,” said Jason McFarland, IADC President. “The 2019-2024 leasing plan, in its current iteration, sets the stage for an exponential increase in offshore production as a percentage of overall U.S. production. Consequently, the potential for a positive impact on the overall U.S. economy would include an expected increase to the GDP of $39 billion annually over the course of seven years, and the creation of over 172,000 jobs over the same time period. The numbers clearly underscore the considerable advantages to expanding offshore drilling access,” said McFarland. IADC and its members look forward to a continued dialogue with the Department of Interior as it works to complete the Proposed Final Program. On 8 March, U.S. President Trump signed a declaration that imposes a 25% tariff on steel and a 10% tariff on aluminum imported to the U.S. On 18 March, the U.S. Department of Commerce announces its procedures for excluding products from the recently announced tariffs. The exclusion request procedures were published in the 19 March 2018 Federal Register and the DoC also began accepting such requests on the same date. As President of the trade association, the International Association of Drilling Contractors (IADC), I have first-hand knowledge of the offshore drilling companies and their ever consistent and extremely honed-in every day, every hour focus on safety for their employees and for the environment in which they work. At IADC we develop and advance safety training for offshore workers and our member companies take their responsibilities in developing our nation’s natural resources very seriously. IADC and our member companies have pushed back on provisions of certain regulations, like BSEE’s Well Control Rule, because we believe they are overly- prescriptive, do not enhance the safety of operations, and in some cases increase, rather than decrease, risk. However, this by no means indicates IADC wishes to scrap the entire Rule, rather IADC has joined with others in publically suggesting ways in which the rule could be revised and improved. The article also gives President Trump too much credit by insisting it was his decision to consider alleviating drilling restrictions on nearly all U.S. coastal waters. On the contrary, the Outer Continental Shelf (OCS) Lands Act of 1953 mandates the process for how our nation’s OCS resources shall be managed. There is only one moratorium in place; the rest of the OCS is open for consideration. The decision to consider offering leases in 25 of the 26 OCS planning areas is consistent with existing law. It is irresponsible to suggest that safety will be compromised if the costs imposed by regulation are reduced. Over the past five years, IADC members have reduced by one-half the frequency at which our workforce is injured on the job – both in the U.S. and worldwide – and the rate of recordable injury cases in the U.S. offshore sector is near 0.5 per 100 full-time equivalent workers. While it is not acceptable for any worker to be injured on the job, this rate compares favorably to almost all U.S. employment sectors. IADC, through its safety and training programs, is continuing its efforts to improve safety in the drilling industry. While IADC cannot responsibly speculate on the monies that might be saved by the pending proposal to revise the Well Control Rule, our objective is cost-effective regulation, not just costly regulation. The U.S. currently produces 1.6 million barrels of oil per day off U.S. shores, fuel necessary to power the lives of all Americans. To put it into perspective, if the U.S. were to halt all offshore operations tomorrow, the country would need to more than double the daily imports we currently get from Saudi Arabia, which currently stands at 1.1 million barrels per day – fuel for thought. The U.S. House voted to fund the Federal government via an “Omnibus package” for six months, or until the end of September 2018. The 2,232 page spending bill was released two days before the current Continuing Resolution’s deadline. In addition, the chamber passed several other bills, with a focus on transportation measures at the end of the month. This month, the Senate approved Kevin McAlleenan as Director of U.S. Customs and Border Protection. In addition, the Senate passed legislation to keep the government open and funded. The omnibus would give $13.1 billion to fund the Interior Department in fiscal 2018. Included in the spending language for Interior agencies are a $79 million spending bump over 2017 enacted levels for the Bureau of Land Management, a $255 million increase for the National Park Service, and a $75 million increase for the U.S. Fish and Wildlife Service. Big news this month is the tariffs the President is levying against China regarding intellectual property and innovation and the steel (25%) and aluminum tariffs (10%) levied on those imports. Additionally, Secretary Zinke testified before Congress in support of the President’s proposed budget for FY2019. During his testimony, he doubled down on his prior assertion that there would be no new platforms off of Florida’s shores for oil and natural gas development. On 12 March, the U.S. Bureau of Safety and Environmental Enforcement (BSEE) announced the implementation of a new Risk-Based Inspection Program that employs a systematic framework to identify facilities and operations that exhibit a high-risk profile. The risk-based inspections supplement BSEE’s existing National Safety Inspection Program. The OCS Lands Act authorizes BSEE to conduct annual scheduled inspections and periodic unannounced inspections of all oil and gas operations. The new risk-based inspection protocol looks beyond compliance and assesses the integrity of critical safety systems on facilities and operations, those that have had multiple incidents of non-compliance or events and may need more attention. Inspection findings and incident reports are used by BSEE to assign a risk factor score to each production facility in the Gulf of Mexico. The risk factor score is based on specific performance and risk-related information that falls into two types of risk-based inspections: “facility based” and “performance based.” Based on analysis of this information, BSEE prioritized the areas that require follow-up under the risk-based inspection protocols. The implementation of this program demonstrates significant progress by BSEE over the past year. The previous administration was criticized for a slow pace in implementing such a program from 2011-2016. The Government Accountability Office (GAO), in a 2012 report, noted the need for an approach that would identify and evaluate offshore operations according to risk. In a later report, the GAO again criticized BSEE’s pace in implementing such an approach under the previous administration. This administration focused on making this a priority. Risk-based inspections allow BSEE the opportunity to focus on compliance issues and reduce the likelihood of incidents across the Gulf of Mexico Region on a continuous basis. BSEE’s first risk based inspections this year will focus on crane operations and will begin this month. The IADC Executive Committee has confirmed the nominations of three new members to the Well Control Institute (WCI) Board of Directors. Tom Burke, President and CEO of Rowan, has taken the place of David Williams, who recently retired from Noble Drilling. Mike Holcomb, President of Patterson-UTI Drilling, has replaced John Lindsay of Helmerich & Payne. Thom Roller, Director of Worldwide Drilling for Apache, has taken the place of Roger Jenkins of Murphy. Both Mr. Lindsay’s and Mr. Jenkins’ terms on the Board had expired. WCI functions as a collaborative body and clearinghouse for critical matters related to well control. It is organized as a wholly-owned subsidiary of IADC. For more information, please contact Steve Kropla at steve.kropla@iadc.org. On 20 March, Australia’s APPEA made publicly available the Independent Scientific Panel Inquiry into Hydraulic Fracture Stimulation in Western Australia 2018. The study is Australia’s 14th inquiry into hydraulic fracturing in recent years and the second such inquiry in Western Australia in the last five years. It chronicles historical information and acknowledges current standards, best practices and regulatory safeguards that have the proven the integrity of the process for hydraulic fracturing in Western Australia. To access the full report, please visit APPEA’s website. Commissioned in September 2016, the “High-Performance Bolting Technology for Offshore Oil and Natural Gas Operations” report was published on 9 March. The report summarizes strategies for improving the reliability of fasteners used in offshore applications. These strategies include the accurate assessment of equipment field performance before failure; roadmaps for additional reliability R&D; improved information sharing of failures, and promulgating best practices throughout the supply chain. The full report can be downloaded through the National Academies of Sciences, Engineering and Medicine website. The Petroleum Safety Authority (PSA) of Norway recently completed its report on the effects of digitalization on the petroleum industry. The primary aim of this project was to provide a better understanding of trends, consequences and recommendations for strategies related to further development of such capabilities. The conclusion of the report highlights a variety of operational technology security concerns in areas such as infrastructure, segregation and HSE consequences of remote operations. The full report, in Norwegian, can be accessed here. For more information, please visit the Health and Safety Executive website. On 14 March, the Ministry of Industry, Business and Financial Affairs made its Maritime Denmark publication available for distribution. The document addresses the country’s maritime growth plan through 2025. Included in the plan is an effort to make Denmark an “internationally recognized pioneer” in the areas of offshore energy and other industrial sectors such as climate solutions and food production. As a part of it’s overall plan, Denmark is focusing on its stable investment frameworks to attract offshore development and the modernization of Danish offshore installations. More information can be found at the Ministry of Industry, Business and Financial Affairs website. On 12 March, the U.S. Coast Guard announced a joint Bureau of Safety and Environmental Enforcement (BSEE)-Coast Guard crane inspection program. This undertaking is in response to BSEE data collected over the course of 2016-2017, which revealed 175 crane incidents had occurred in that timeframe. The data reflects the continued high-risk nature of offshore crane operations. Beginning this spring, inter-agency teams will be visiting multiple drilling and production operations across the U.S. Gulf of Mexico. Data collected from this joint effort will contribute to further analysis, which will culminate in a future report and recommendations for increasing the safety of crane operations. The U.S. Bureau of Land Management recently prepared a Draft Environmental Impact Statement (EIS) for the Greater Chapita Wells Natural Gas Infill Project, and is announcing the opening of the comment period. Oil and gas drilling has been ongoing within the Chapita project area since 1952. This Draft EIS is not a decision document, rather it’s purpose is to inform the public and the decision makers of the impacts associated with implementing the proponents drilling proposal and alternatives, as well as solicit comments from other agencies and the public. The Draft EIS analyzes a proposal by EOG Resources Inc. to further develop natural gas resources on their Federal leases in the project area. EOG’s proposal includes drilling up to 2,808 new wells and constructing associated ancillary transportation, transmission and water disposal facilities within the project area. The proposed life of the project is 55 years, with drilling and development activities to occur within the first 15 years. The new gas wells would be drilled to the Green River, Wasatch, Mesaverde Group (including the Blackhawk), Mancos and Dakota formations at depths of 6,000 to 15,000 feet. With regard to this project, the BLM needs to respond to EOG’s request to develop its existing 28 leases covering the subject lands. BLM will determine whether the proposed project, or an alternative to the proposed project, would best respond to EOG’s request in a manner consistent with the existing 30 contractual obligations between EOG and the U.S., as well as BLM’s multiple use mandate. IADC intends to draft a brief document supporting the development of this project. The comment deadline is 23 April 2018. To read the entire statement, please visit the BLM website. For more information and to assist with development of IADC comments, please contact Rhett Winter at Rhett.Winter@iadc.org. The New Mexico Department of Transportation invites the public to comment on the state’s first amendment to the State Transportation Improvement Program. The program will serve as a four-year plan for the state’s federal aid highway program. It contains proposed road and bridge projects and is required under federal legislation. Projects on the list include federal and state highways, which are roads designated as I, U.S. or NM. The Department has posted the 2018-2023 amendment on the internet to solicit public comment until 19 December 2018. The State Transportation Improvement Program is developed in conjunction with state, local and tribal transportation agencies as well as regional planning organizations. Projects are funded with a combination of federal, state and/or local funds. The amendment is posted on the New Mexico Department of Transportation website. 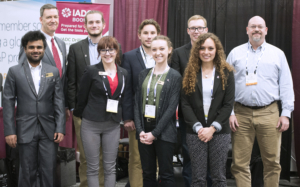 Students from the IADC Student Chapter at Missouri S&T were invited to visit and experience the 2018 IADC/SPE Drilling Conference, 6-8 March in Fort Worth, Texas. Back row from left are Mike DuBose, Tyler Charles, Grand August, Dalton Buchanan and MS&T Professor Rickey Hendrix. Front row from left are Vishwaksen Reddy, Tessa Mortensen, Katie Miller and Megan Lopez. Mr DuBose is IADC VP of International Development and serves as staff liaison for IADC’s student chapters. IADC will relocate its current headquarters in July of 2018. While the current space has served the Association well over the last 15 years, the lease is set to expire this summer, and with it an opportunity to reevaluate the space. Over the last several years, it has become clear that the needs of the Association necessitate a more modern facility that can accommodate a multitude of industry and committee, and also one that offers more sufficient space for IADC employees. Taking advantage of a soft market for office space in Houston, IADC recently signed a lease that will more than adequately address IADC’s needs. The new IADC headquarters will be located at 3657 Briarpark Drive, a mere half a mile from the current building. It will offer a brand new, custom-designed office space, and modern meeting facilities that will offer significant value to IADC’s members. Over the course of the next few months, IADC will provide updates on the progress of the new space, and the Association looks forward to welcoming members to the new corporate headquarters this summer. Karen Boman has joined IADC as Associate Editor for Drilling Contractor magazine, responsible for creating print and digital content for the magazine, eNews and websites. Ms Boman holds a Bachelor’s degree in journalism from Texas A&M University. She has more than 15 years of experience in oil and gas reporting, previously writing for ODS-Petrodata, Rigzone.com and, most recently, Offshore Engineer. She can be reached at karen.boman@iadc.org. Register at the IADC ART Committee website to hear new ideas on diverse topics at the next IADC IADC Advanced Rig Technology (ART) Spark Tank, scheduled for 08.30-11.30 on Wednesday, 4 April, 2018. Topics include new ideas in solids separation, reusing and recycling produced water, automated choke valve, and making real-time data available for all land operations. The Spark Tank provides an opportunity for technology entrepreneurs to pitch their products and ideas (“Sparks”) to a panel of drilling contractors and operators (“Sharks”). The purpose is to provide insights to technology developers into what matters to those they are innovating for. IADC is grateful to its Sharks for sharing their time, talents, and expertise. Sharks for the 4 April Spark Tank include Randy Mutch, Vice President, Wellsite Technology, Ensign Energy Services Inc.; Theresa Baumgartner, Drilling Research Engineer, Shell; and Paul Pastusek, Drilling Mechanics Advisor, ExxonMobil Corp. Spark Tank presenters have 15 minutes, with 15 minutes allotted for a Panelist Q&A. Have we reached the pinnacle of mechanical solids separation? Since the introduction of Shale shakers in 1922 we have seen various improvements to enhance solids separation and minimize associated fluid losses. However, ultrafines (10-1 micron) are still controlled via dilution. Dilution only hides the problem and does not solve it. Instead of avoiding waste, dilution adds waste which is against the main principle of waste management. Evodos technology minimizes the required fluid volume to be added and results in cost reduction. Evodos technology applies 4500G on the fluid while the travelling distance of the particles to be removed is ¼” only. The separation efficiency achieved with this technology is not possible with current technologies. Downstream of conventional centrifuges, the machines only process a volume comparable to conventional dilution volume and produces a clean drilling fluid whilst keeping the emulsion intact. “The Next Oilfield Step: A Circular Economy Approach to Reuse, Recycle, and Reduce Production Water”: Bill Burch, Ocota Inc. While the economists focus on the daily fluctuations in the price of oil and natural gas, analysts rarely ever mention the enormous amounts of produced water operators have to handle. It is estimated that at least 1 billion bbls of water is produced daily at a cost of more than $500 billion a year. Almost all produced water currently is disposed of due to salinity and dissolved ions. Some is treated and reinjected back into conventional reservoirs for pressure maintenance of the field. But operators have faced increased scrutiny and government imposed injection limits for produced water disposal due to earthquakes being linked to salt water disposal wells. In addition, the cost of disposal has increased fivefold over the last decade. Fresh water is the one of the three key limiting factors in the future of the oil and gas extraction. Using licensed patented carbon nanotube low energy input multi-stage flash distillation equipment technology, Ocota, Inc. is helping to transform the biggest generated waste stream in the oilfield into a value proposition for operators and service companies by helping reduce operating expenses, solving bottlenecks on finding fresh water for drilling fluids, hydraulic stimulation and emergency response, and potentially reducing salt water disposal rates by up to 90% – if not completely eliminating the need for more wells altogether. With the rapid adoption of new technologies and new processes for drilling wells in a historically tight economic climate, the industry can no longer simply do “what we’ve always been doing”. In the case of choke valve control for conventional or advanced drilling processes such as MPD, new levels of precision, speed, control, and processing power are required in order to reach semi-automated or fully automated drilling systems. Tolomatic’s ServoChoke® SVC actuator utilizes many of the automation industry’s proven technologies that are utilized daily on a global scale (brushless servo motors, absolute multi-turn encoders, planetary roller screws, and servo class gearboxes). These integrated technologies are providing new levels of accuracy and reliable performance in choke valve control. These components are an integral part of what it takes to make a fully automated system that is robust and reliable for mission critical applications. With up to 10x gains in repeatability, 2x gains in speed, along with global certifications, zero maintenance, and a rugged exterior, this innovative new breed of oilfield automation equipment is helping to foster the implementation and adoption of automated drilling systems in the future. Real time data systems currently exist but uptake has been limited for a multitude of reasons particularly the cost and difficulty in utilizing a single system across multiple suppliers. Many potential users are also deterred by the perceived low value provided by remote monitoring due to lag times in confirming a drilling problem and communicating with the rig site. Our collective experience confirms the value of applying real time data to critical decisions that can ultimately impact reliability, efficiency, and safety of drilling operations. In launching Proactive RT Solutions our approach has been to design a new system focused on eliminating the inherent difficulties of present systems to realize the potential value of utilizing real time data in a proactive collaborative manner. The Real Time Advisory System (RTAS) is designed using the latest IT technologies to preclude the need for a purpose built real time center and instead can be accessed at any location and on any web enabled device. The system eliminates the existing problem of “false alarms” or lack of decision time by utilizing a set of algorithms that mimic the experience of seasoned drilling foreman and drillers. By simultaneously evaluating many drilling parameters users can be forewarned of impending down hole problems with lead times of one to ten hours in most cases. This lead time allows for a thorough discussion and quality response to an impending issue. RTAS is a viable choice for land operations. Cyberattacks have the potential to devastate entire companies, thus, cybersecurity has quickly become a major corporate concern. IADC has actively pursued the development of cybersecurity solutions and guidelines as they relate to drilling assets for nearly four years. The Association has focused on developing best practices based on existing standards to assist drilling companies as they build cybersecurity into industrial control systems (ICS) and operational technology (OT) systems across the industry value chain. This workshop is intended to serve as a forum for drillers, operators, and the service sector to discuss cybersecurity standards, best practices, and the influence of cybersecurity on automation. Sponsored by Secure-NOK and Rowan Companies, the workshop will also examine the NIST Cybersecurity Framework, ISA/IEC 62443, the two existing IADC cybersecurity guidelines (“IADC Guidelines for Assessing and Managing Cybersecurity Risks to Drilling Assets” and “IADC Guidelines for Baseline Cybersecurity for Drilling Assets”), current IADC initiatives, and will look ahead to the necessity of future efforts. Registration for the one-day workshop is limited, please register via the Cybersecurity Committee website. For questions about the workshop, please contact Siv Hilde Houmb at sivhoumb@securenok.com or Melissa Mejias at Melissa.mejias@iadc.org. The IADC Supply Chain Committee is now open for all supply chain professionals who are members of IADC. The Committee will host its next meeting on 9 May at 1 p.m. at IADC Headquarters in Houston. The IADC Advanced Rig Technology Committee will meet at OTC in room 702 of NRG Center at NRG Park at 09.00 on Thursday, 3 May, the final day of the world’s largest oil and gas event. IADC has been an Endorsing Organization of OTC since 1991. Click here to register. Watch for the agenda! For more information about the IADC ART Committee, contact Mike Killalea, 713-292-1956 or mike.killalea@iadc.org. With the long-anticipated “Big Crew Change”, the drilling industry’s many white-haired and grizzled veterans will fade into the sunset, replaced by a younger generation with perhaps significantly different attitudes and aptitudes. What will be the impact on drilling operations, HSE, and technology? The IADC Drilling Engineers Committee’s 13 June Technology Forum, “The New Age in Drilling”, sets its sights squarely on how the changing of the guard impacts development of new technology, refinement of business models, and the perspective of drilling professionals. How does the current generation differ in their approach to technology and decision-making? Is today’s approach advancing industry’s ability to take full advantage of the opportunities these new technologies and personnel offer? Do the changing roles that these technologies demand provide opportunities for the new generation of drilling personnel? Are we attracting the talent, plus growing and retaining our personnel, with the cultural mindset to adapt to the market changes in our business? If not, how do we do so? DEC wants to hear from those who are now and will continue to shape the future of our industry. The goal of the Tech Forum is to foster a discussion on how industry is responding to these challenges and what improvements and strategic direction the new generation envisions for it. To submit an abstract, click here. Deadline for abstracts is Monday, 14 May. The Drilling Control Systems Subcommittee is writing a survey on usage and value of the IADC Daily Drilling Report. The subcommittee of the IADC Advanced Rig Technology Committee is undertaking a review of the venerable IADC “Tour Sheet” and plans to revamp the form in both print and electronic formats. The “DDR Plus” project will also include work to map rig sensors to drilling states and to develop guidelines for rig sensor stewardship. Also, a workbook comparing and analyzing Drilling States is now available on the ART Committee website. The workbook was developed by John Macpherson for DSATS Drilling States Initiative. For more information about the ART Committee, DCS Subcommitte, or the DDR Plus project, contact Mike Killalea, 713-292-1956, mike.killalea@iadc.org. API has requested that IADC provide feedback on API RP 59, Recommended Practice for Well Control Operations. Feedback from IADC is needed no later than the start of the API Summer Standards Conference on 11 June 2018. IADC will convene a meeting of onshore and offshore drilling contractor members at IADC Headquarters in Houston at 10 a.m. on Monday 9 April to discuss concerns and options for API RP 59. The consensus from the meeting will be forwarded to API. Those interested in attending the IADC meeting can register online here. Also check out the new issue on the DC Digital Reader – can be read on iPad or Android tablet, and/or your Windows or Mac computer. Emulsions can be water-in-oil, which are referred to as regular emulsions, as well as oil-in-water, which are called reverse emulsions.